Large, long-legged, slow-moving, heavy wader that feeds in shallow water in southern wetlands and swamps, and is the only stork that breeds in the US. Often feeding in groups, the Wood Stork continuously moves his bill from side to side probing and feeling for food. The population has been on the decline since the 1960’s due to water management practices in South Florida and loss of habitat the Everglades. Wood Storks typically only occur in Tennessee from mid-July through September. Description: Tall, dark, bald head and upper neck, all white plumage, black iridescent wings and tail feathers; long, black, thick bill that is thicker at the base and slightly decurved. Voice: Usually silent, some hissing and bill clattering during nesting. Egrets – Straight bill, feathered white head, no black markings in the wings. White Ibis – Much smaller, bright red face and bill, black on wings tips. Whooping Crane – Taller, shorter bill, red face, white head and less black in the wing. Whooping Cranes only occur in Tennessee in winter. 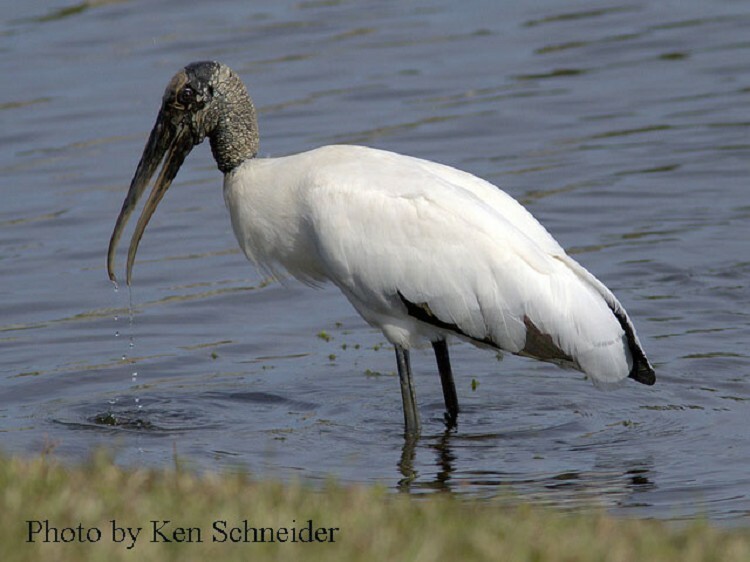 Habitat: In Tennessee, the Wood Stork can occasionally be found in wetlands and swamps in west Tennessee. Diet: Crustaceans, frogs, lizards, rodents. Nesting and reproduction: There are no known records of Wood Storks nesting in Tennessee. Status in Tennessee: The Wood Stock is occasionally seen in marshes, shallow ponds and mudflats in Tennessee. During breeding season Wood Storks toes turn pink. A Wood Stock can live 20-30 years. Best places to see in Tennessee: Ensley Bottoms, Mud Island State Park, Eagle Lake, Reelfoot Lake in mid-July through September.